The barrel roll that Richard Russell pulled off during his flight Friday evening looked sloppy to experienced pilots. 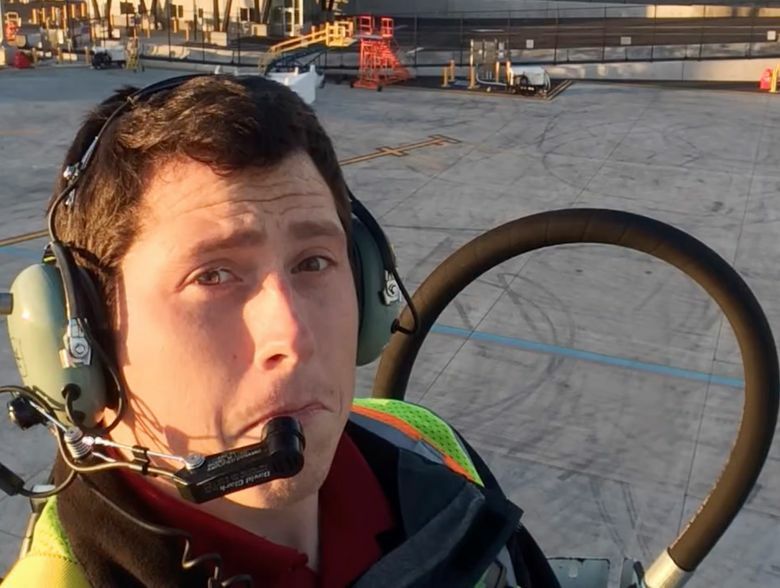 But the fact that the baggage handler completed the trick at all was evidence to some observers that Russell, who died when the Horizon Air plane he stole crashed into an island in South Puget Sound, may have taken lessons or otherwise prepared for his flight. Stoking the speculation was Russell’s response, captured in audio recordings posted online, to an air traffic controller asking if he was comfortable flying the twin-engine turboprop plane. It’s unclear whether the 29-year-old, a member of a generation that grew up around video games, was joking about his familiarity with a joystick, or leaving investigators a clue as to how he was able to start the aircraft, taxi onto a busy runway, take off and mix in aerial acrobatics for more than an hour before he went down. Horizon Chief Executive Officer Gary Beck told reporters that Russell didn’t appear to have a pilot’s license. Yet aviation instructors, pilots and safety experts suspect that he had some sort of training, whether from a flight-simulator game or some form of lessons. Mary Schiavo, an aviation attorney and former inspector general of the Department of Transportation, said video of some of his turns looked smooth, or “coordinated” in pilot parlance, keeping the plane’s nose from veering to one side or the other. Though Schiavo and other experts think Russell’s flying prowess indicated prior experience in the cockpit, one longtime family friend, who works for the Federal Aviation Administration, said that he did not have any knowledge of Russell going to flight ground school in Alaska, where Russell lived before moving to Oregon and, later, Washington. He also never saw Russell use a flight simulator and did not know how he figured out how to fly the Bombardier Q400 plane. “For us it was a shock that he would be able to take off in that,” Mike Criss, a resident of Wasilla, Alaska, who has known Russell for more than two decades, told the Anchorage Daily News on Monday. Criss said that his son, Zac, and Russell were boyhood friends, and that Russell had a personality like a magnet. A Horizon Q400 pilot, speaking on the condition of anonymity, listed some of the hurdles Russell would have encountered Friday. At the outset, the plane’s controls would have been locked. Starting the engines requires a precise sequence of switches and levers. And during acceleration at takeoff, pilots steer left and right with rudder pedals, instead of the obvious control yoke in front of them. Games like Microsoft’s Flight Simulator franchise, a favorite of computer desktop pilots for decades, are complex and realistic, rendering models of cockpits full of switches and instruments patterned after the real thing. Enthusiasts can add to the realism of that experience with hardware that replaces keyboards and mice with airplane-style controls such as rudder pedals or a steering-wheel-like yoke. The main flight simulation games on the market don’t feature the Canadian-built Q400 Russell flew among their default options for digital fliers, but a community of game developers has filled that gap. One modification, which makes the plane available for Microsoft Flight Simulator X, is listed online for $59.95, and YouTube videos offer tutorials on tasks like plane startup. “You can learn procedures” from simulators, said Jim Grant, owner of Northway Aviation, which trains private pilots at Everett’s Paine Field. Beyond that, he said, their utility is limited. Would-be pilots who come to Northway for training sometimes brag to instructors about familiarity with flight simulators, Grant said. In addition to baggage handling, his work as a gate-service agent included work on two-person tow crews responsible for moving aircraft around gates and maintenance areas. During that process, one gate-service agent sits in the cockpit as a second drives a tractor pulling the wheels below the plane’s nose. “On any other day that was windy, or that was cloudy, or had [bad] weather, I don’t think he would’ve been able to pull a stunt like that,” said Jeffrey A. Lustick, a Bellingham aviation lawyer and pilot. Seattle Times staff reporters Hal Bernton, Lewis Kamb and Dominic Gates contributed to this story.